I’m a die hard New England Patriots fan. I’m even trying to convince my wife that Tom Brady Liotta would be a great name for a son. The Patriots have been a source of pride for me for much of my life. They’ve been synonymous with the word “success” and are perennial favorites to not only reach, but also win, the Super Bowl. How many fans can say that about their team? Sure there are detractors out there, but I don’t care. I’m from Boston and I’m proud to say I’m a Patriots fan. So, as a loyal fan of a team so used to winning, you can imagine my utter shock and disappointment at seeing the Patriots lose their home opener to the Arizona Cardinals on Sunday, 20-18. What bothered me most wasn’t the fact that we—notice how I refer to my favorite team as “we”—made careless errors, or that we missed a last second field goal that would’ve won the game. What bothered me more than anything else was the fact that we lost to the Arizona Cardinals. The Cardinals: the team with a quarterback, John Skelton, whose name makes him sound more suited to be a son of Skeletor than an NFL quarterback. The team that hadn’t beaten New England since 1991. The team that was 13.5 point underdogs going into the game. The Patriots were supposed to win this game. They beat every lowly opponent like a freshman from Dazed and Confused. So what happened against the Cardinals? It didn’t make sense to me. But, after replaying the Gronkowski penalty and Gostkowski missed field goal over and over in my mind, I realized that this loss might be the best thing to happen to the Patriots in years. Allow me to explain. As NFL fans go, Patriots fans may be the most spoiled. We’ve become so accustomed to winning that anything less than a 14 win season and Super Bowl berth is considered a failure. In the Brady-Belichick era, we’ve been to five Super Bowls, winning three. We’ve had a 16-0 regular season, a 20-game regular-season home winning streak, and seen our quarterback, Tom Brady, have a 50-touchdown season. Aside from those two heartbreaking losses to the Giants in the Super Bowl, which still sting by the way, there’s been little for Patriots fans and players to complain about, which is exactly why we needed this loss. 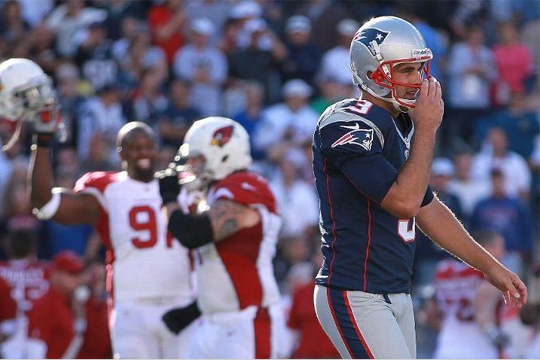 As Herm Edwards once said, “You play to win the game.” Sunday proved that to the Patriots. Despite the fact that we were double digit favorites, we lost. Plain and simple. It felt almost like a playoff loss it was so unexpected and painful. But in a way, it may be a blessing in disguise for the team. Patriots fans often feel the Super Bowl championship is our right in New England. But as we’ve learned all too well, being the best team in the regular season doesn’t guarantee anything in the postseason. In fact, teams that have struggled early on and endured rough patches throughout the year are often the ones who end up hoisting the Lombardi Trophy in February. In 2010, the Green Bay Packers snuck into the playoffs at 10-6, and had to win three road games just to reach the Super Bowl, where they eventually defeated the Pittsburgh Steelers 31-25. And then there was last year’s Giants team. They finished the regular season 9-7, barely making the playoffs. There was even talk midseason during a four-game losing streak that coach Tom Coughlin was likely out at the end of the year. But, the team figured things out and made the playoffs, getting hot at just the right time and eventually beating the Patriots in Super Bowl XLVI. Those teams proved that it doesn’t matter how you start, it’s how you finish, and, more importantly, it’s how you learn to overcome adversity. 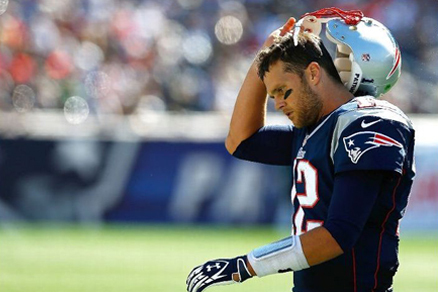 The Patriots have seen season after season of hot starts end in disappointment. Maybe Sunday’s loss will once again make the Patriots realize the kind of struggles a team must endure to become a champion. Definitely agree on the spoiled bit. See all the fans leaving their seats with two minutes to go while we still had a shot at a turnover? Loved the read, helps me think positive about a discouraging loss.